Thanksgiving is in just a couple days! I am already anticipating the feast. The boys and I have been preparing for the big day by exploring books about food. The books have far less calories than the goodies I'll be consuming in a little over a week. 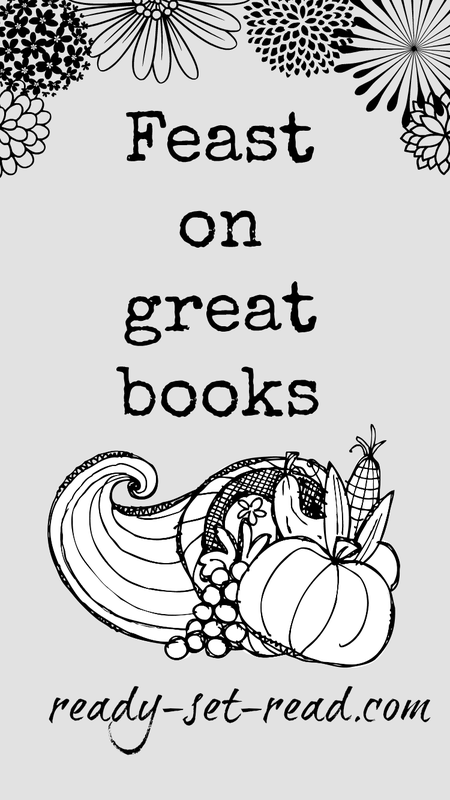 If you'd like to feast on a few good books, check out some of our favorite books about food. Last week I wrote about our author of month, Karma Wilson and her book, "Bear Says Thanks". 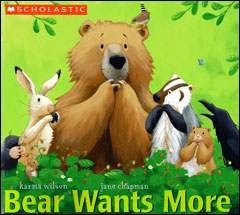 This week I am sharing another book about Bear. This time, he is not sharing a feast of stories, he is actually feasting on lots and lots and lots of delicious food. Bear Wants More by Karma Wilson Bear wakes up from winter hibernation and he is hungry. His helpful forest friends search for food with him. Bear eats so much, he can't return to his den to feast with his friends. This book might be a good reminder to not eat so much at Thanksgiving dinner that you can't fit back in your house! Children can be apprehensive about trying new foods. Books can help children discuss the types of foods they'd be willing to try. When Logan was younger, we used "Growing Vegetable Soup" by Lois Ehlert to explore different types of fruits and vegetables. Worms for Lunch by Leonid Gore is another cute book for exploring new foods. In our house, we let the boys try a new food and then say, "no thank you" if they don't like it. 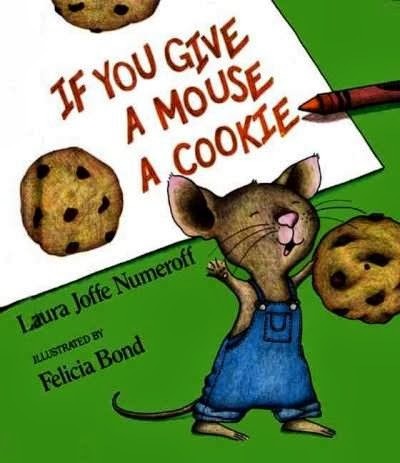 This book is a silly look at how different animals prefer to eat different foods. It led into a great discussion about favorite foods and not so favorite foods. 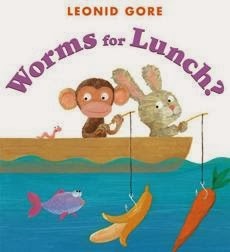 We all decided we we would not like worms for lunch. This book also has creative die cuts that change as you flip through the book. It makes the story great for little hands to explore! 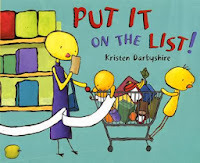 Put it on the List by Kristen Darbyshire In a true to life story, the chicken family keeps running low on household necessity. On Monday, they have cereal but no milk. On Tuesday, they have toothbrushes but no toothpaste. On Wednesday, they have cookies and no milk. On Thursday, the take a trip to the store. But when the return home, they realize they are still missing needed items. Finally, a trip to the restroom without any paper requires a family meeting. The family decides to create a grocery list to take to the store. 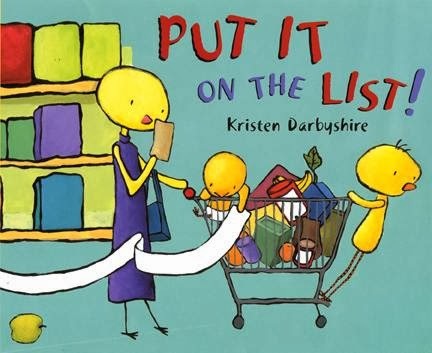 My boys found this story funny, it was a good introduction to writing a grocery list, and there are many labeled food items which helped Logan to write his list. 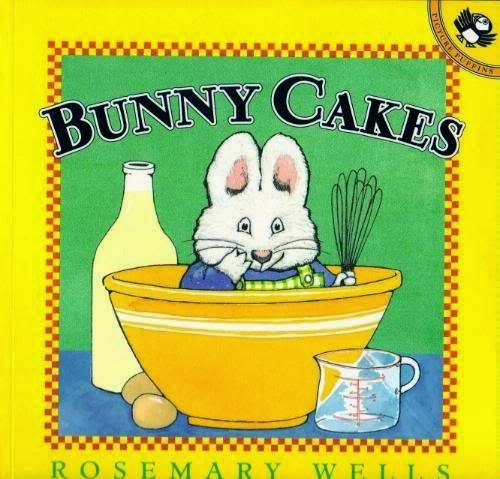 Bunny Cakes by Rosemary Wells is another wonderful look at writing a grocery list. In this Max and Ruby story, Ruby wants to make a raspberry-fluff cake for Grandma. Max wants to make an earthworm cake topped with marshmallow squirters. Max keeps messing up Ruby's supplies and Ruby continues to send Max to the grocery with a list of items. Each time, Max tries to add Marshmallow Squirters to the shopping list, but the grocer can't read his writing. Finally Max relies on pictures instead of words. This book is a great look at how illustrations can be powerful and convey meaning. It can empower emergent writers to try to write their own grocery lists. 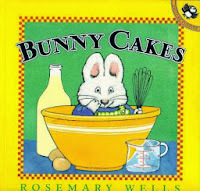 Bunny Cakes by Rosemary Wells also fits nicely into the category of books about baking. There are several other books about baking that we love. The Gingerbread Man retold by Jim Aylesworth, illustrated by Barbara McClintock This is the classic tale of the gingerbread man who is baked up by an old man and old woman, escapes the oven, eludes the butcher, the cow, and the sow, and ends up tricked by a clever fox. This is a sad ending for the cookie, so if you prefer a happier ending, check out Gingerbread Baby by Jan Brett. Gingerbread Baby by Jan Brett In this story based on the classic tale, The Gingerbread Boy, a young boy named Matti works to make a gingerbread boy. Matti, however, peeks in the oven door before the allotted cooking time is completed. The cookie baby escapes and the chase begins. 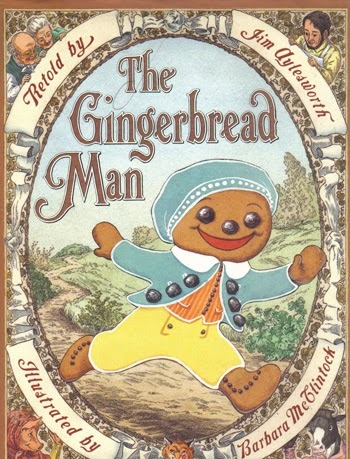 This book is a nice twist to the unhappy demise of the original Gingerbread boy. 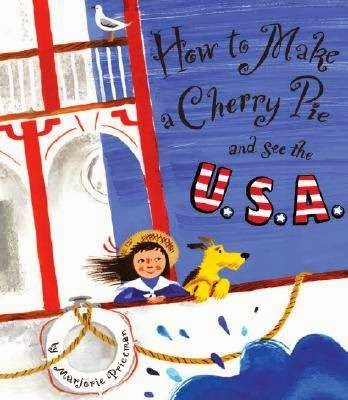 How to Make a Cherry Pie and see the USA by Marjorie Priceman This book begins with a recipe for cherry pie, but when the cook shop is closed, the reader is taken around the USA to gather the supplies for a cherry pie-- including natural resources for making pie pans, bowls, rolling pins, etc. 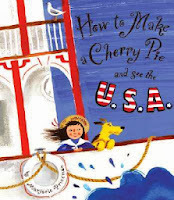 Features of the USA are introduced as the reader visits each location. This book is more about geography than baking, but readers do learn the essential supplies needed to stock a kitchen for pie baking. 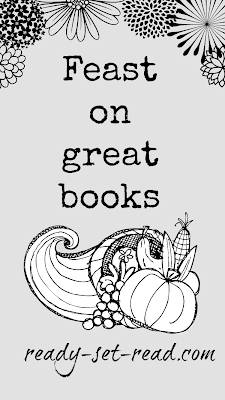 Do you have a favorite book about food? Share it in the comments below.